Welcome back, Brandon! Oscar is looking good so say: Hello back to him! He has a big chip missing on the left side of his beak, doesn't he? Do you know what happened? Pajarita wrote: Welcome back, Brandon! Oscar is looking good so say: Hello back to him! He has a big chip missing on the left side of his beak, doesn't he? Do you know what happened? His beak is just flaking, He's starting to rub it on his perches now that he's around his cage more since I moved it into my room.There was so much flaking I scratched a lot of it off too. It does look funny! But maybe his yellow spot will grow to encompass the 'eyebrow' And nice to hear from you, again, Seagoatdeb! Thanks. He look like he may be starting to develop another eyebrow on the other side too. Well he is ready for Halloween. Oh I am so sad. Sunny got spooked by something and did a panicked flight and crashed into things a few times, the hardest being the side of his cage. He broke off all his outer wing feathers on one side. He seems to be okay other than that, but it so harsh on such a sweet shy parrot. He cant get around like he use to. Also I will wait a few days and watch him but I might have to clip a few feathers on the other wing to balance him. I will be rearranging my living room so he can fly to me and not miss. My daughter told me her Meyers next door panicked at the same time, so they saw something outside, we dont know what it was. I am so glad Gaugan is the kind of parrot who wont pick on a parrot that is like this, she has been super sweet to him. Poor little guy. Young birds are insecure and spook much more easily than older ones - and he had some issues when he was a baby, too, didn't he? He will be fine, feathers grow back - but I would recommend you even out his primaries so he doesn't feel a bigger drag on one side than the other. Pajarita wrote: Young birds are insecure and spook much more easily than older ones - and he had some issues when he was a baby, too, didn't he? Thanks. he seems to be doing better already he is acting normal and he is able to fly to me which is surprising, but he is a good flyer and very careful to land safely. Not like Gaugan who comes flying to me when she hears me get out of bed and i am around a corner so she has no idea where she is going to land and i have to put an arm out to catch her....lol.. so he is going to be fine and get around just not as good as before and has to work harder to fly. i just get so worried about my babies. He is doing very well at getting where he wants to go...so may do one at a time...i hate to clip him at all but will a bit if i have to. He just looks like his confidence has been taken down a bit. He even has a bit of his attitude back....lol...whenever i give him food he taps on the bars of the cage with his beak...he only doesn't tap if its a nut...i am sure he is trying to teach me what he likes and thinks i am a slow learner. Pois do have phobic reactions just out of the blue......Gaugan has hardly ever had them...only to balloons and earthquakes. But something just spooks them and you never find out what it is sometimes. its the first time he has done this and he is 2 1/2 now....he used to freeze when scared, that was what i worried about when he was a baby, because he was never socialized properly and traumatized from all the moves he had to do but he grew out of it. 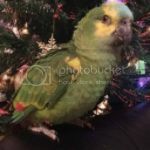 He is a very happy confident parrot and very affectionate. He has learned a lot of ways to communicate what he needs to me. Gaugan is continuing to be extra nice to him so thats good too. Hmmmm, I don't know about pois having more phobic reactions than other birds. I've never observed this in any of the ones I've had [six of them]. Actually and in all honesty, my birds don't seem to have any of the problems that other birds have with changes or unexpected things happening. I move them from one cage to another, change the placement of the cage itself, put new toys, perches, bowls, etc in, and everybody is perfectly fine. They also never spook - I mean, they might take off from where they are perching if there is a sudden movement or noise they were not expecting but they don't crash into anything. I can't offer a scientific explanation for this but my theory is that this happens because I am such a maniac about eliminating any potential source of stress [they have other parrots around, are fully flighted, always kept in the same place, under the same schedule, and nothing is ever asked of them]. I think that this practice reduces the inevitable stress caused by captivity and, as they feel more relaxed, in time, it makes them feel less vulnerable and more self-assured.